Can social media help with SEO? Before we answer that question, a quick glossary of common search engine optimization terms for readers who may not be SEO experts. Search visibility: A metric used to calculate how visible a website or page is on a SERP. If the number is at 100 percent, for example, that would mean the URL is ranking in the first position for a keyword(s). Search visibility is especially important when tracking the aggregate ranking of a website for a basket of keywords. Domain or page authority: The strength of a website or page on a particular subject in the eyes of search engines. For example, the Hootsuite blog is perceived by search engines to be an authority on social media marketing. This means we have a better chance to rank for keywords related to social media than a food blog like Smitten Kitchen. But now it’s 2018. A lot has changed over the past four years. One noteworthy shift is that social networks started appearing in search engines at a much larger scale. Notice the exponential growth of Facebook and Twitter pages making their way into Google’s results? Well we did, and thought it was time to analyze the relationship between SEO and social media with a series of tests. Say hello to “Project Elephant,” an experiment named for the ‘elephant in the room.’ The elephant in this case being the long-asked-but-never-answered question: can social media help improve search rank? Representatives from Hootsuite’s inbound marketing, data analytics, and social marketing teams came together to develop a reliable and controlled test approach. To simplify the number of data points, we chose to run this first test on Twitter and built out a publishing schedule to keep ourselves on track. But before launching the test, we needed to level the playing field. So, for a full week prior to the launch, none of the 90 articles chosen for the experiment were updated or promoted. This allowed us to establish a baseline of their search rankings. Following this step, we promoted two posts per day from Group A and Group B over a two-week period and measured the results during the following week. Start to finish, the entire experiment took about a month to run. Going in, we understood the accepted position on the topic is: there is an indirect relationship between social media and SEO. That is, content that performs well on social will likely earn more backlinks, which helps boost search rank. Because of this indirect relationship between social and search ranking, we needed to be able to articulate whether traditional domain/page authority metrics played a role in any change of rank. Page authority metrics were based on aHrefs’ Live Index. aHrefs is an SEO platform that crawls webpages and collects data on the relationship between websites. To date, they’ve crawled 12 trillion links. The rate at which aHrefs crawls the web is second only to Google. From a high level, we can observe an improvement in search visibility between the three keyword baskets. As you can see from the results above, there appears to be a strong correlation between social activity and rankings. Let’s sink our teeth into the actual data points to better understand the mechanisms behind the boost in ranking. As illustrated, the control group sees the lowest levels of ranking improvements, and the highest levels of ranking declines when compared to other test groups. 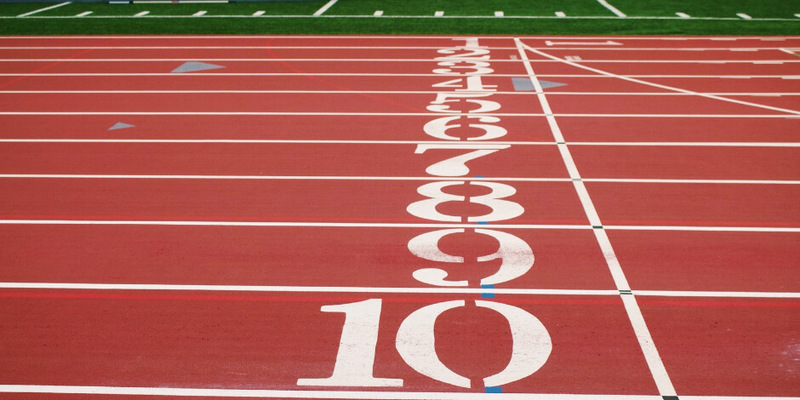 Although rankings were recorded for the duration of the test, we specifically wanted to zero in on changes that happened immediately following a piece of content being promoted on social media. 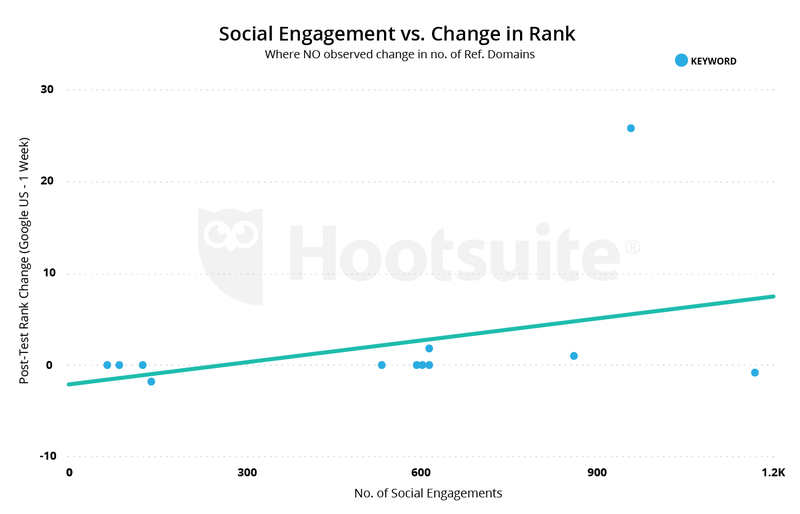 The scatterplots above illustrate the change in rank observed within the first 48 hours of a piece of content being shared, along with the total number of social engagements. As you can see, the organic and boosted test-groups perform much better than the control group, where there are more observed ranking losses. 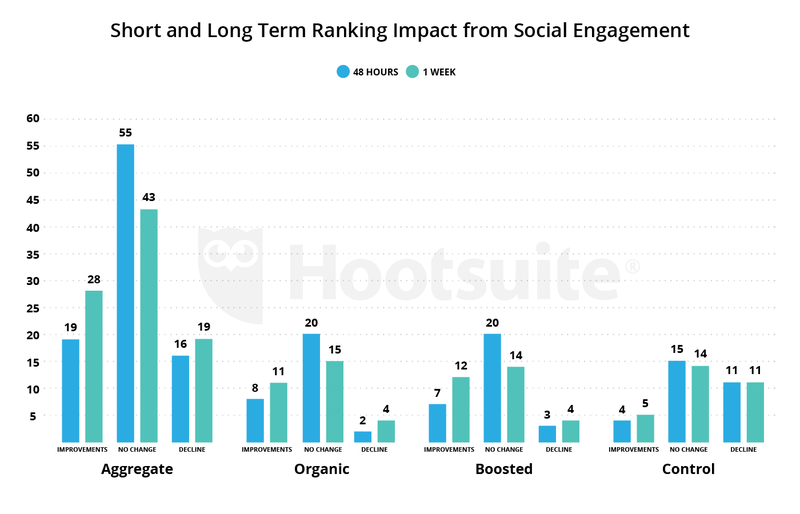 The above chart looks specifically at the change in rank within the first 48 hours vs. the total number of social engagements associated with that content asset across all test-groups. Looking at the data from the surface, we can observe a positive linear trendline, indicating a positive relationship between the number of social engagements and change in rank. 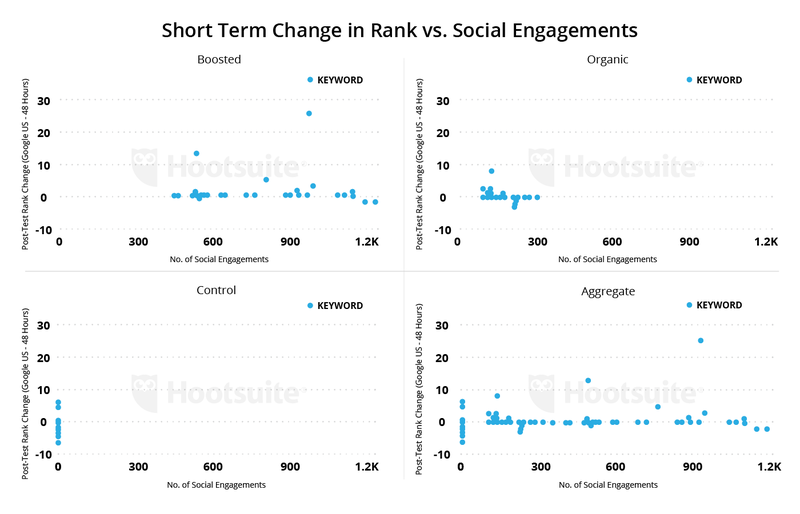 Of course, any seasoned SEO strategist would question this correlation due to a number of factors relating to how social engagements can influence other metrics that are in fact ranking factors. More on that later. When looking at the the total number of social engagements vs. change in rank after one week across all test-groups, we can also observe a positive linear trendline, indicating a positive relationship between the two metrics. But what about the age-old argument of: social activity leads to more links, which leads to better rankings? As mentioned above, Google has traditionally refuted the fact that social activity influences rank, instead suggesting that social engagement may impact other metrics, like links, which could impact your rank. 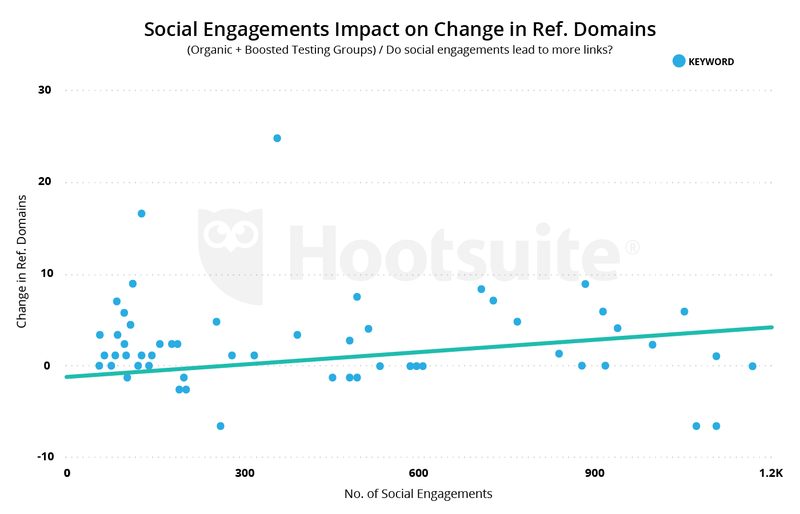 This chart illustrates the change in referring domains pointing to a piece of content being promoted vs. the number of social engagements it received. As we can see, there is most definitely a positive correlation between the two metrics. SEO experts can keep scrolling, as they already know the answer to the question of whether or not links correlate with better rankings. Social marketers, however, should listen up. The above charts illustrate rank vs. the number of referring domains pointing to the content asset in context. As you can see, there is a strong correlation between the number of websites pointing to a piece of content and relative rank. For fun, we filtered results by search volume and observed a much less significant correlation for keywords with more than 1,000 monthly searches, indicating a higher level of competitiveness. This makes sense. You’ll see much bigger improvements on less competitive terms for every link gained, versus more competitive terms. What happens if we take away instances where we observed a change in referring domains? 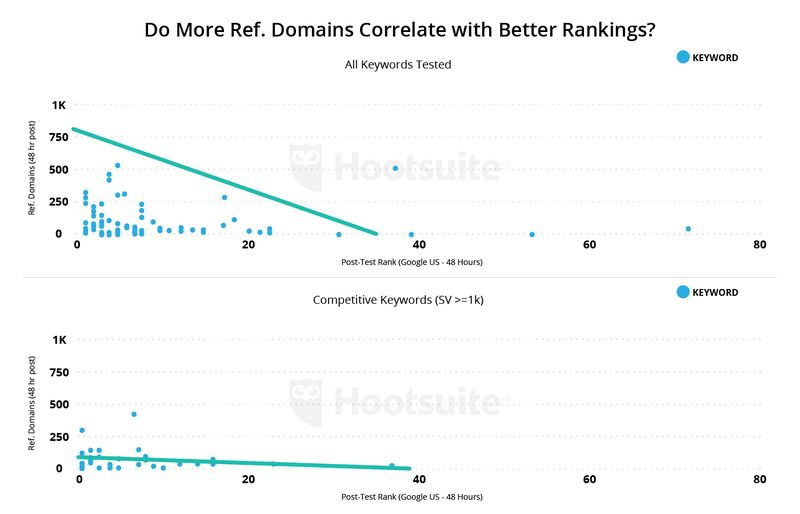 To properly challenge the theory that social marketing can only influence rankings through acquired links, and not rankings directly, we removed all instances of keywords that observed a change in referring domains over the test duration. What we were left with, were only two factors: rank change and social engagements. Admittedly, this level of filtering gutted our sample size, but left us with a promising picture. 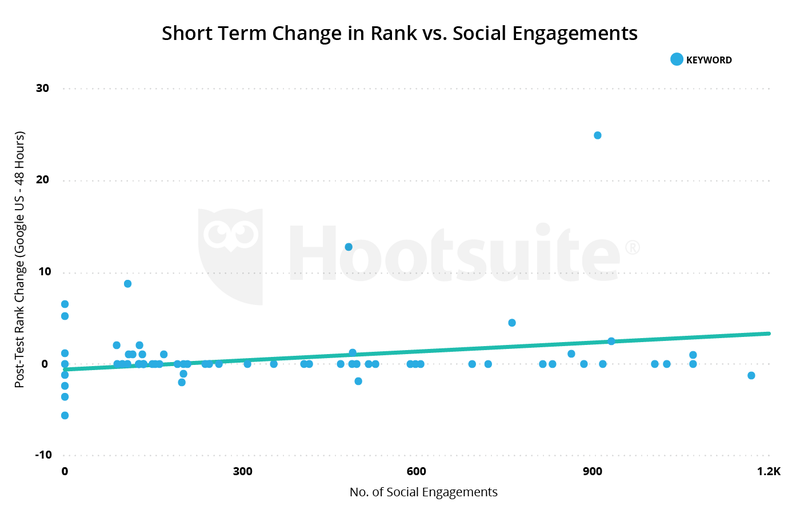 There is a positive correlation between social engagements and change in rank. 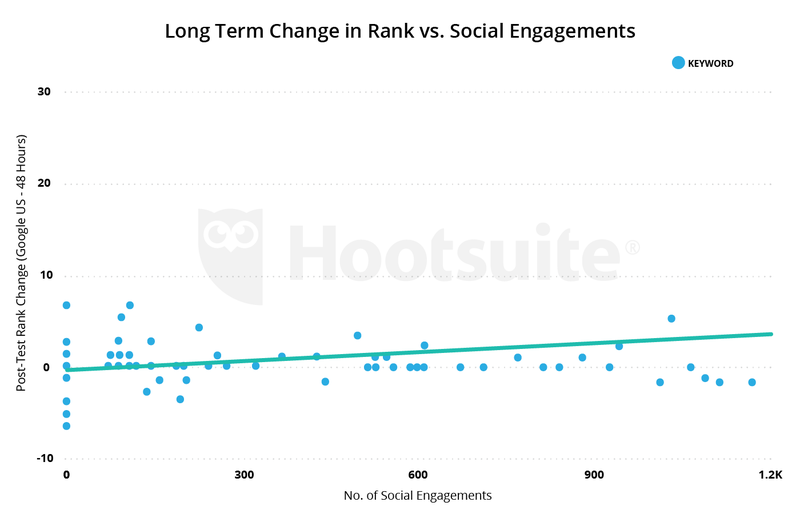 Overall there were more improvements in rank associated with social engagements than observed ranking losses. 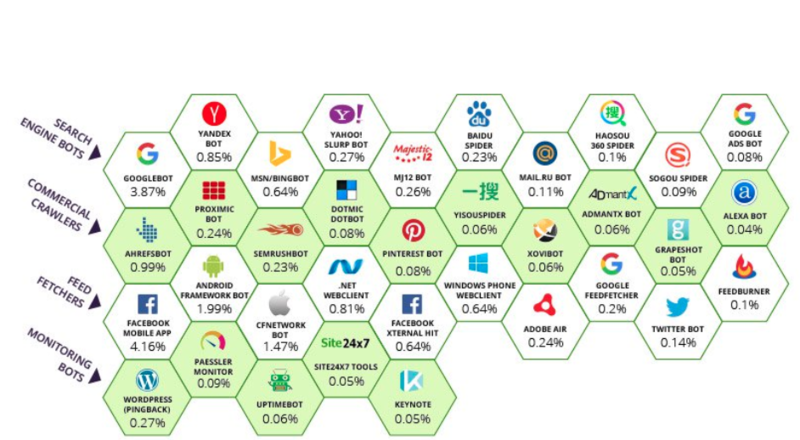 Of course this data encourages a larger-scale test, which would be difficult to pull off considering the stringent SEO and social methodologies applied to this experiment. Zak has over 10 years of experience in SEO, specializing in enterprise SEO. He has led organic search programs for big brands like Avis and Budget, and has supported search strategies for Cigna, ToysRus, and many more. Currently Zak leads the SEO strategy at Hootsuite, the world's largest social media management platform, as their Great SEO Owl. Eva is Hootsuite's Senior Manager of Global Social Marketing. She loves creating and executing digital strategies and social campaigns, ideally while enjoying a slice of fresh bread with butter.